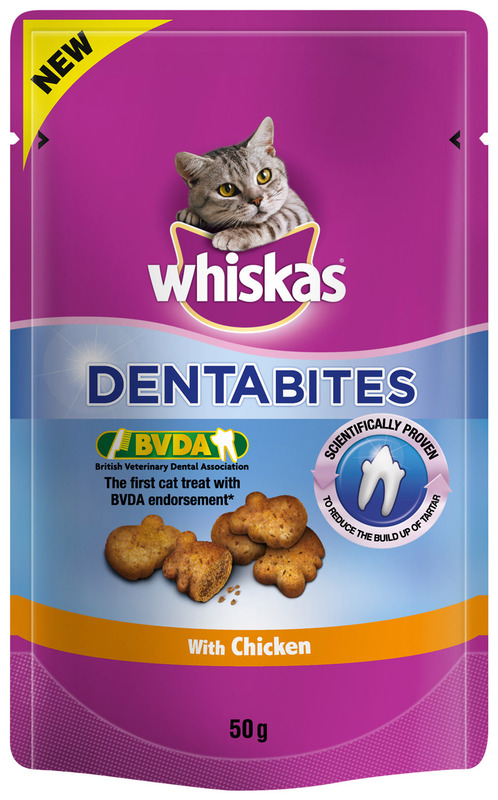 Whiskas Dentabites are tasty little cat treats which provide dental assistance by helping to remove plaque as your cat enjoys the treats. The chewy, abrasive texture encourages your cat to chew as the treat does the cleaning. The treats contain green tea which has been scientifically proven to reduce plaque. Suitable for cats over 10 months old. Cereals, Vegetable Protein Extracts, Meat and Animal Derivatives, Oils and Fats, Minerals, Derivatives of Vegetable Origin (including 1% Green Tea). Feed an average cat 8 pieces per day. Once opened use within 4 weeks. There are currently no questions for Whiskas Dentabites Cat Treats - be the first to ask one!